Your weather dates have not been set. They have defaulted to medium settings. As gardeners, we understand the importance of light and temperature to growth. Flowering plants and vegetables are best grown in as sunny a place as possible for the best results. We use glasshouses to this end, using materials that transfer light with as little hindrance as possible. To non gardener, it may be difficult to imagine why we should construct a shadehouse to reduce light. In high summer, the amount of light falling on plants may be much more than is needed for growth. High light levels contribute to the development of leaf colour and flowering, though in many cases, excessive light can be harmful. A shadehouse allows a balance of the amount a plant receives with the amount it needs. Reduced light levels in summer slow plant processes so that less watering is needed. High temperatures and intense light can damage some plants. Seedlings benefit from a few days in the shadehouse to harden off before before planting outside. Shadehouses increase relative humidity by lowering temperature, light and air movement, allowing plants adapted to a cool, moist environment to b grown successfully. 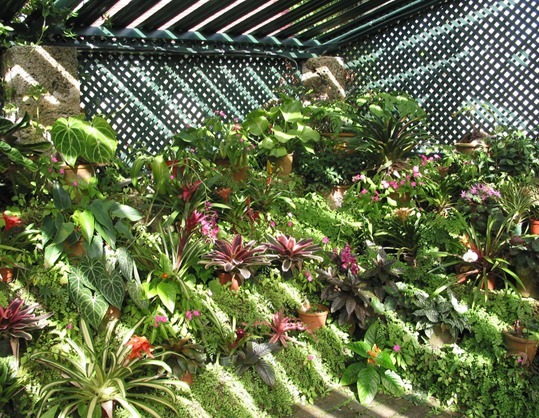 Shadehouses allows easier propagation of azalias, begonias, ferns and fuchsias, which, in their natural environment, are plants of the forest floor. A shadehouse provides protection from damage in extremes of wind, hail, frost as well as heat and will be a pleasant place to sit on a hot summer’s day. Shadehouses can be bought ready to assemble, coming in modular sections that can be extended with additions at a later date. 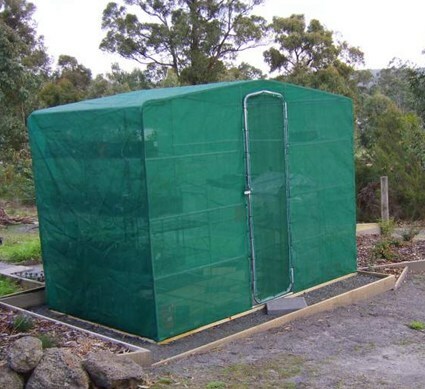 When building a shadehouse, the same factors apply as when building a greenhouse. A simple shadehouse can be made using timber or galvanised steel posts to support a roof. Once again, look around to see what other people have to glean some ideas. Shadecloth is the most widely used material, knitted or woven synthetic fabrics in a range of colours. The amount of shade can be specified, form very light (30%) to very heavy (90%), to allow for suitability to plants. If shadecloth is considered unsightly there are many alternatives. The framework can be used to support laths, narrow strips of timber, 25mm wide fixed to a support or even sections of manufactured trellis. Wider timber boards can be used; the distance apart can be adjusted to light needs. Flexible stems of willow can be threaded through large mesh chicken wire. Light rolls of brushwood can be bought, normally used for screening but also used as a ‘roof’. If a truly rustic effect is required and time and materials are available, willow woven into panels much like the old sheep hurdles would be an interesting project. 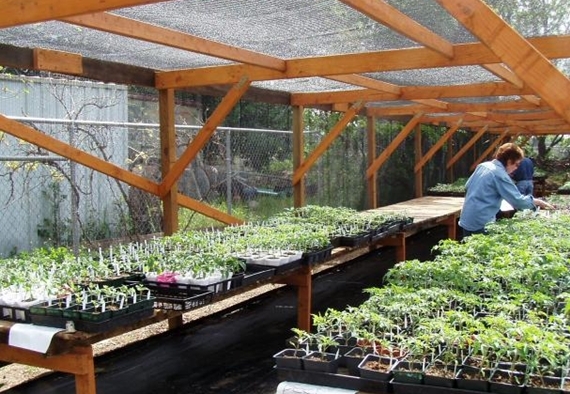 As to shape and size, greenhouses, it depends on your needs. A convenient size for home use would be 1.5 metres square with a height of 2.1 metres. Plants in pots can be kept on stands or grown directly in the ground, ferns, epiphytes and trailing plants can be hung from the roof and sides. You may like a gravelled or hard area to place trays of seedlings to harden off before planting out. Make sure that the structure is strong enough to support additional weight.